Now that the excitement of SearchLove London is behind us, we thought we’d console ourselves with a few of our favourite stories and snippets from the action-packed two days. It was wonderful to see attendees from across Europe and beyond fill The Brewery, all eager to hear about the most advanced ideas and strategies driving online marketing today. Indeed, a flurry of messages in different languages landed in our Twitter feed as Duncan welcomed the first speaker. As the lights dimmed, Marco Montemagno ran onto stage to fill the room with his boundless energy and tales of unconventional marketing. How do you create a buzz around a business with little or no budget? Through partnering up with others. As founding organiser of Social Media Week, Marco created excitement around the Rome event by partnering up with high speed train company, Frecciarossa. One thousand journalists and bloggers were transported to the Italian capital in style, creating plenty of press before the event had even begun. Amelia Showalter then gave us an eye-opening look into the workings of a presidential campaign. Having acted as Director of Digital Analytics for Obama’s re-election, Amelia performed extensive A/B testing of emails. The result? Mild cursing in subject lines, ugly highlighting and casual talk all returned good results – defying many of the team’s previous assumptions. In turn, Amelia encouraged the SearchLove audience to foster a culture of testing. It seems we shouldn’t trust our gut! Next up, Simon Penson shed light on the new rules of big content promotion. Okay, you’ve created something great, but how do you maximise its reach? As Simon persuasively argued, it’s about people, not email accounts. You must get to know your audience, find out what niches they sit within. One way of identifying key sites for your content is using PReacher, a tool created by Simon and his company Zazzle Media. The SearchLove audience was guided around the big wide world of International SEO by Aleyda Solis. Talking us through the various aspects of consideration, Aleyda explained that translation is not only about language but understanding the subtleties of each country’s specific dialect and set of cultural codes. A story about cheese illustrated this beautifully. Food-producer Saputo wanted to expand the sales of its feta cheese into the Spanish-speaking market, yet its name ‘Fetos’ translates into ‘fetus’ – a rebrand was definitely needed! For help with understanding your international audience’s behaviour, check out the Consumer Barometer. Wil Reynolds - Google Approved Paid Links? Next up, Wil Reynolds shared his experiences with using Google-approved paid links. His hair-raising story began with giving a freshman $10k ‘play money’ with the objective of getting eyeballs on content. Across a series of tests, Wil accepted that failures were part and parcel of the process (he jokingly referred to this as ‘burning money’). However, once the gruelling research was over, he discovered how to make a high return from little investment. Abby Covert then demonstrated the many intricacies of ontology. It seems that meaning is a tricky beast – this being highly subjective and shaped within socio political parameters. Demonstrating the importance of ontological considerations, Abby gave the example of a company using images of white lanterns across different countries. In America white lanterns were commonly used for decoration at weddings, while in China they symbolised mourning. Ontology expert please! Next, Distilled’s Craig Bradford encouraged businesses to find value in the customers they already have, rather than trying to find new ones. Indeed, Craig urged the adoption of a whole new mindset: focus on the customer, not the sale. Universal Analytics allows you to do this pretty easily by tracking the user not the session, potentially showing a conversion rate of 100% rather than, say, 33% as split across three devices. Stacey Cavanagh owned the stage as she outlined many of the ways to bait brand signals through content. Surveys can often make lots of noise, especially if they tell an interesting story. For instance, Stacey launched an opinion poll which asked Americans to name UK cities other than London. When ‘Wales’ and ‘Paris’ were found among the top results, a newsworthy piece was born. Use this discount code and enjoy $75 off your next Google Consumer Survey. 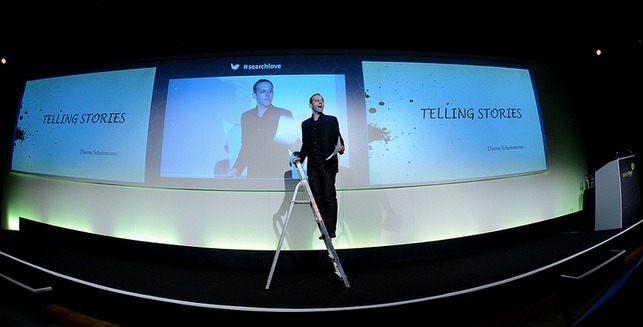 Day one ended with a bang when Tom Anthony and Will Critchlow got up on stage for a SearchLove double-act. Considering many aspects of the future of search, Tom and Will talked through the shift in Google from indexing to understanding. A search for ‘Usain Bolt’, for example, returns relevant information including his height and weight. Meanwhile, typing ‘Eileen Collins’ skips talk of the astronaut’s measurements and, instead, reveals a history of her space mission and suchlike information. Google is, thus, more able to understand what kind of information the user is interested in. Following Monday night’s SearchLove party, Danny Scheinmann was the perfect antidote to any fuzzy heads. Putting theory into practice, Danny demonstrated the power of storytelling to capture the imagination of an audience. 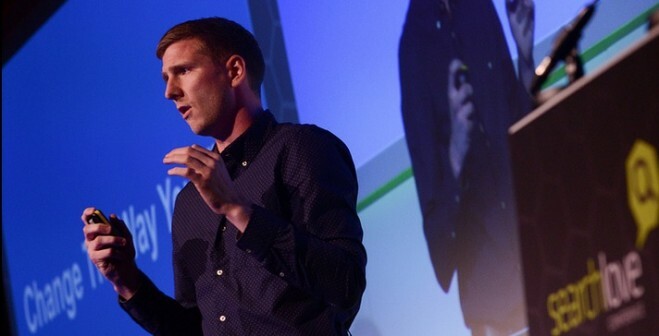 Indeed, the SearchLove audience was in the palm of his hand as Danny explained the phenomenal success of John Lewis’ Christmas advert; rather than showing any products or merchandise, the TV ad captured viewers with a simple love story between two lonely snowmen. Nathalie Nahai delved into the fascinating world of web psychology. How can you be persuasive online? Well, through understanding and taking control of the many psychological signals that shape how people think. Being sensitive to a particular culture forms a key dimension. Nathalie, for example, highlighted the distinction between long term- and short term-oriented cultures. While the former values things such as free materials and non time-critical content, the latter likes more instant gratification such as same-day delivery and ‘buy now’ functions. Making maths considerably less scary, Kelvin Newman explained the significance of Graph Theory for search in simple terms. He argued that Facebook’s Graph Search could be the next big thing on the internet, potentially becoming more powerful than Google. For, according to Kelvin, search isn’t about keywords anymore, it’s about entities. Facebook recognises the relationships between things – a huge advancement for the way we find results. Distilled’s Bridget Randolph set us all frantically scribbling notes as she described the steps needed to devise a comprehensive mobile strategy. This all anchored around the question: How can I anticipate and fulfill my users’ needs? Bridget brought the subject to life with examples by brands such as Red Bull. The energy drinks company used Twitter to search for the word ‘exams’ and ‘mid-terms’; it then sent people a care package of Red Bull and ran a Tumblr where recipients could share ‘thank you’ photos. Mark Borkowski gave a highly thought-provoking talk which explored the history of power and persuasion in the media. He argued that today’s digital landscape requires a reinvention of PR around collaborative conversations that afford the story more global reach. This calls for harnessing the power of the crowd, but how do you effectively motivate people? Sharing one of his own publicity stunts, Mark told us how he once invented a tap-dancing dog. After much attention from the press, he ‘killed it off’ with a story of a road accident in Stratford which, after a local outcry, persuaded the council to bring in a one-way system. Answering many crucial questions, Chris Bennett explained how to create big content strategies that go the distance. For one thing, it’s about re-purposing content across different platforms. Chris showed us how he launched a piece on the 11 coolest companies to work for in Seattle, inspiring the chosen few to share the results on social media. He then re-launched the same piece in other American cities, and further expanded its reach by letting companies know they were in the running for the prize and devising plans for an award ceremony. Next up, Paul Madden bid farewell to spam and said hello to data, giving a personal account of his realisation that he needed a change of approach. Sharing a quote from his grade 11 teacher, “Paul is easily influenced by his peers”, served as an honest insight into his susceptibility to follow the crowd. However, with changes in Google in 2012, Paul energetically went about adopting a new data-focussed approach in his career as an SEO. Peep Laja asked: How do you persuade someone to buy your product without using words? Design can be enormously powerful – in fact, 94% of a viewer’s first impression of a website is based on how it looks. Peep talked us through a range of effective ways to increase visual engagement. Photographs play an important role, as does breaking up long chunks of text into three or four line paragraphs with plenty of subheadings. 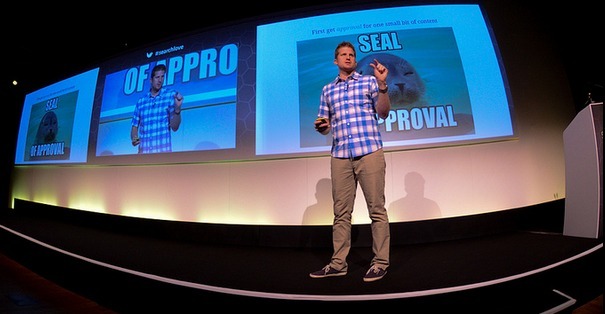 Leaving the audience on a high, Will Critchlow was the final speaker to take to the SearchLove stage. Will championed the potential for small businesses to do great things with their marketing. For, unlike the bigger players, small businesses often benefit from having a passionate and agile team. The success of Hawksmoor served as a great example; the East London restaurant owner walked around to neighbouring businesses to introduce himself, fostering a trust and personal connection with people. Will also highlighted Twitter as a way in which the restaurant engages in one-to-one conversations with its customers in order to built a great reputation. Finally, we’d like to say a massive thank you to everyone who attended. Were you there? Don’t forget to leave your feedback of the event.